*PLEASE NOTE – THE DIRECTIONS BELOW DO NOT TAKE INTO ACCOUNT THE RE-NAMING OF I-95 TO I-295… PLEASE USE MAPQUEST TO GET THE CORRECT DIRECTIONS UNTIL WE CAN CORRECT OURS BELOW! Take the Rt US 1 N. exit (Exit 46A). This will place you on the Rt. 1 Bypass. Stay to your right and take the Oxford Valley exit. Make a right at the base of the exit ramp, proceed to second light (N. Buckstown Drive) and make another right. (There’s a Margarita’s on the corner.) Follow N. Buckstown to Town Center Drive (large dark blue sign here). Make a right onto Town Center; the next right puts you into our parking lot. Take the US Rt. 1 N exit 46 in the direction of Morrisville. Stay to your right and take the Oxford Valley exit. Make a right at the base of the exit ramp, proceed to third light (N. Buckstown Drive) and make another right. (There’s a Margarita’s on the corner.) Follow N. Buckstown to Town Center Drive. (large dark blue sign here). Make a right onto Town Center; the next right puts you into our parking lot. At the intersection of Rt. 1 and Oxford Valley Road, make a right. (There will be a Pep Boys on your right.) Proceed to N. Buckstown Drive. (There will be a Margarita’s on your left.) 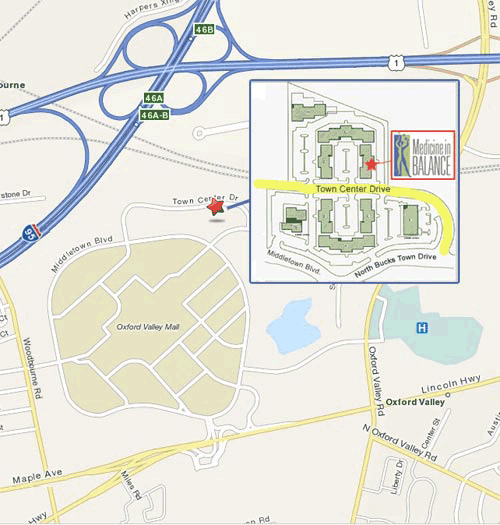 Make a left, follow N. Buckstown to Town Center Drive (large dark blue sign here). Make a right onto Town Center; the next right puts you into our parking lot. For directions from all other points, see MapQuest.